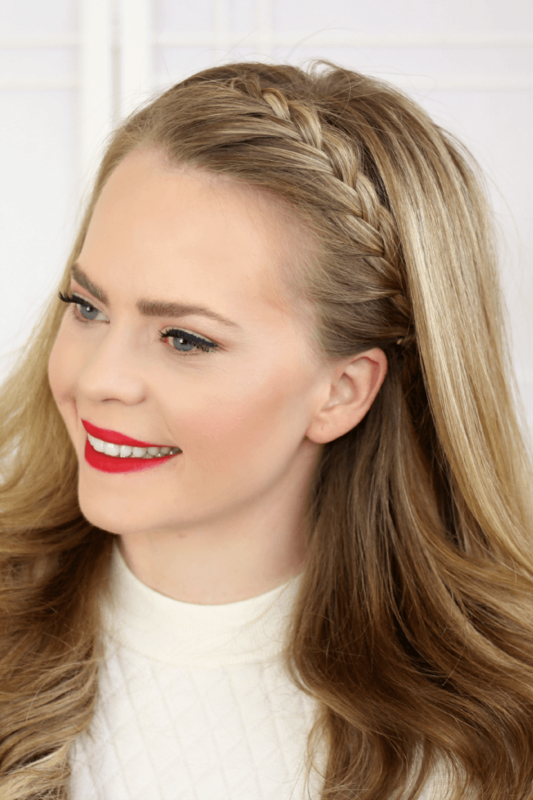 Four Headband Braids is a tutorial that will teach you how to do a French Braid Headband, Lace Braid Headband, Dutch Braid Headband, and Half Dutch Braid Headband. Headbands are all the rage right now and have been seen from the runways to celebrities alike. 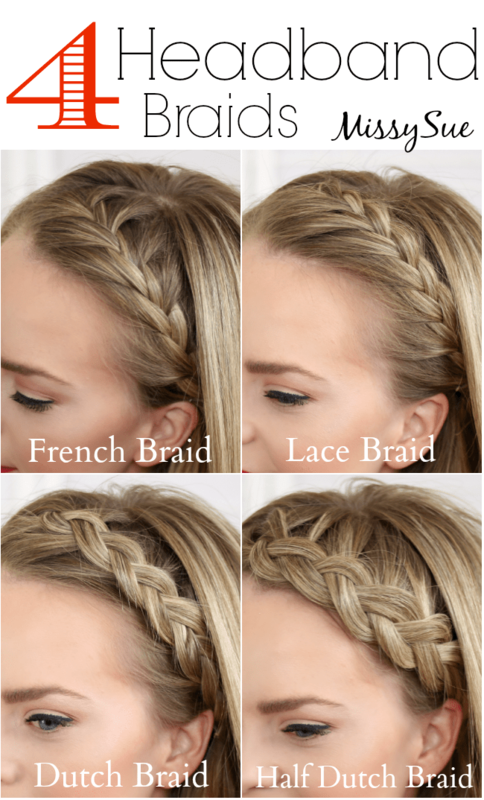 A great way to switch up the look is to wear a braided headband instead of a regular one. This tutorial will show you how to do four fun ones and luckily they are all easy to learn. Step 1 / Begin by separating out a front section of hair; from the part down to the left ear and clip back the rest. Step 2 / Take a section right near the part on the heavy side and divide it into three strands. Step 3 / Cross the back strand over the middle strand. Step 4 / Now cross the front strand over the middle strand. Step 5 / Cross the back strand over the middle strand then pull in hair that lines up with that strand and add it in. Step 6 / Next, cross the front strand over the middle strand and pull in a section of hair that lines up with that strand. Step 7 / Continue repeating steps 5 and 6 until you reach the top of the left ear. Step 8 / Secure the braid with a hair pin or two. Step 9 / Let down the hair that was clipped out of the way. Step 5 / Cross the back strand over the middle strand (do not bring any hair into the braid). Step 3 / Cross the back strand under the middle strand. Step 4 / Now cross the front strand under the middle strand. Step 5 / Cross the back strand under the middle strand then pull in hair that lines up with that strand and add it in. Step 6 / Next, cross the front strand under the middle strand and pull in a section of hair that lines up with that strand. Step 5 / Cross the back strand under the middle strand (do not pull in any extra hair). These hairstyles are all so amazing! They work perfectly! Thanks! What is the best pomade or gel or anti-frizz smoothing cream or whatever for all the little hairs that escape or when doing an updo? This post and the video are SO helpful! Thank you for explaining and showing how to do this so I can actually understand! Wow, you are so gorgeous but I love the self-deprecating facial expressions. Just out of curiosity, do you color your hair? It looks natural but unbelievably pretty & matches your eyebrows. Also wondering if the pictures are airbrushed because your skin is flawless! Unfairly flawless :-) I swear, I’m not trying to sound like I ‘m having a girl crush. I was just blown away & in the rare mood to post it. Hi Jamie, Thank you! I highlight my hair with golden blonde and white blonde highlights. I also dye my eyebrows medium ash brown. Amazing. Your eyebrows match your hair perfectly! I don’t understand the difference between a late braid and a French braid? 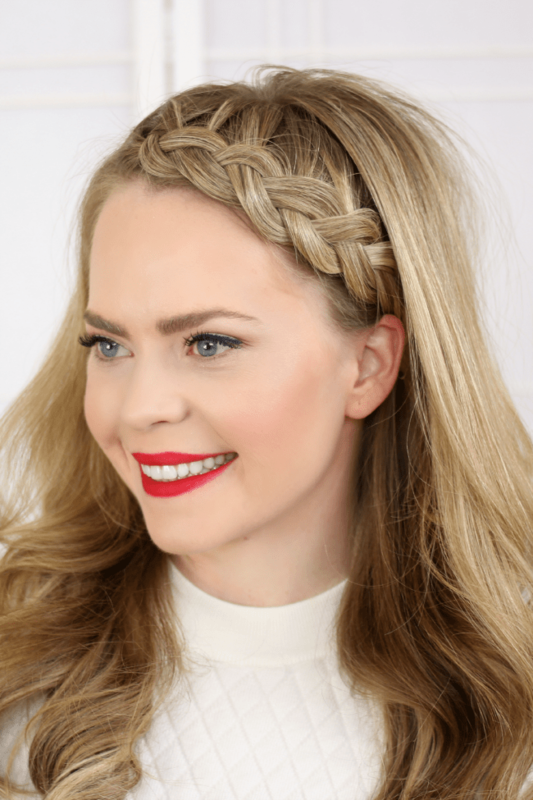 A french braid has hair pulled in on both sides while a lace braid only has hair pulled in on one side. Love these braids! Also love your lip color – what is it?! Hi Amy, I actually recently received it and have been trying it out (: a review is coming soon! Thanks! Loved this! And your hair color is beautiful!! They all look great, but #2 and #3 are my favourites. Your tutorials are brilliant! all of your braids are great!! But I like the half French braid best!!! I want to do the half dutch braid on my hair so bad! All pretty, but the first is my favourite.